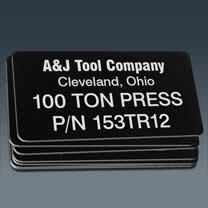 Rigid DuraBlack blank labels are strong and lightweight. The thicker aluminum offers greater impact resistance in rugged environments making them ideal for asset tracking and product identification labels, property ID tags and more. Why Choose MPC's Rigid DuraBlack Blank Labels & Tags? Mark on demand with any CO2 laser with ease. More durable than black anodized aluminum or laser-markable acrylic tape. Maintains original black background even in extreme heat and humidity, long-term exposure to weather, UV, salt spray, abrasion, industrial solvents, chemicals and more. Black background offers high contrast against silver graphics. Manufactured using a multi-level abrasion-resistant coating bonded to an anodized aluminum face stock. Expected exterior life is up to 10 years. Matte (non-reflective with flat finish). None. Labels are blank for on-site marking. Produces silver graphics.